G’day from Australia. 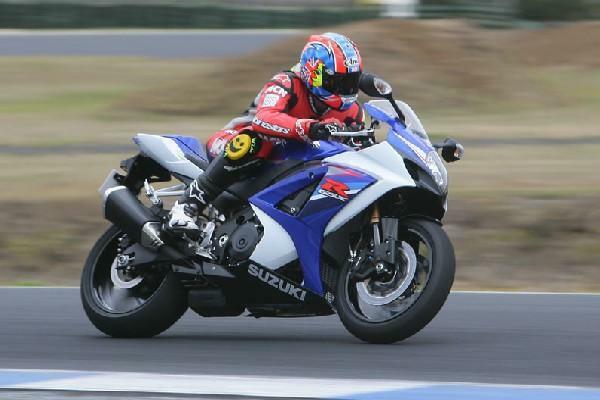 We’ve just finished riding the brand new K7 GSX-R1000 at its World launch at Phillip Island, and first impressions are that Suzuki has once again created a winner. 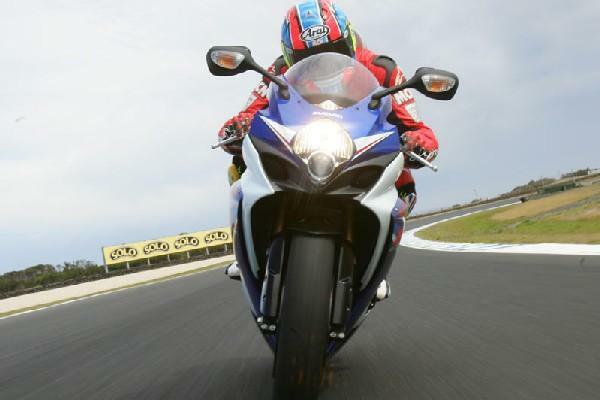 It shouldn’t come as that much of a surprise really as Suzuki has never made a bad GSX-R1000. From the first K1 model that rocked the sportsbike world in 2001, to the equally mind-blowing K3 in 2003, and the K5; which again took road-going superbikes to another level in 2005. The all-new K7 is faster, more powerful and polished than ever. That alone should strike fear into the opposition, but not only that it’s easier to ride than ever before; a trick only the Honda FireBlade has ever got close to. And that should make the new Suzuki as formidable on the road as it is on the track. Like the all-conquering K5, the power delivery right across the rev-range is incredibly smooth and linear. Low down in the revs the power has been softened off slightly, so you don’t get the instant, neck straining initial bout of acceleration previous GSX-R1000s would dish out. Because of this it doesn’t seem as impressive as the K5 at first, but it actually lets you get on the throttle easier coming out of slower corners. Keep the power wound on and things definitely get exciting, as that familiar GSX-R1000-like ocean of mid-range torque floods in, which smoothly builds to a relentless, howling, neck-straining crescendo of high rpm madness. Top end power is now akin to a K5 with a full race exhaust system, and that’s pretty damn wild from a standard road bike that meets tough new Euro three emission laws. Of course the GSX-R1000’s extra power (up from 178bhp@11,000rpm to 185bhp@12,000rpm) isn’t the only big news here. It’s the three-way switch on the right-hand handlebar that you can toggle on the move to alter the power delivery – MotoGP-style. In ‘A’ mode you get full power. In ‘B’ mode the power is softened right off at low revs, but once they climb past around 9000rpm at full throttle you’re back with full power. In ‘C’ mode there’s even softer power at low to medium revs, but then the engine just goes flat after the 8000rpm-mark, the bike is still swift in this mode but it turns the GSX-R1000 into an SV650. Playing with the different settings it’s clear that at a fast and flowing circuit like Phillip Island circuit the benefits of the softer power options aren’t that great, as the corner speeds are generally so high. The bike has more than enough grip and poise, and you’re not winding the gas on hard at low speed (apart from a couple of corners). On our tighter, twistier tracks and of course on the road it could be a different story. Because the GSX-R1000 is so friendly with all of its power available, you shouldn’t think of the ‘A’ mode as some kind of mental mode, as it’s still very easy to ride. The theme of adjustability doesn’t stop with the engine power delivery, the footpegs are now three-way adjustable like the GSX-R600 and 750 and suspension now has high and low speed compression damping. Forks now have much more adjustability than the K5’s and give better control into and through the corners, where the old bike could feel vague. The K7 isn’t as light as the K5 thanks mainly to those cat-heavy twin exhausts, so the new bike isn’t quite as lithe and nimble, but we’re talking very small differences here. The seat is far narrower so it’s easier to climb all over on the track, but other than that the riding position is very similar to the old bike and is roomy (even with the pegs on their tallest position). Oh, the handlebar grips are ‘grippier’, which is a nice race bike touch. One of the weak points of the K5 was its slipper clutch, which could be a fickle, weak, dragging little devil of a thing under hard use. The K7’s clutch has a modified cam, four instead of three reaction springs and is now hydraulically operated instead of cable – let’s hope that’s cured it. Brakes have the same feel and power as the K5’s, which is a bit of a shame. They’re up to the job on the track, no question but they lack the initial bite and power of the stoppers fitted to the FireBlade. The K7 comes with new BT-015 tyres, which is the replacement for the BT-014. Credit must go to these road tyres that they stood up perfectly to the abuse of a bike that has close to 170bhp at the rear wheel at a track as fast as this. On the road the new K7’s impeccable manners is going to make it hard to beat, on the track it’s power and poise is going to make it tough for the competition to keep up. And if you’re a Superstock racer you’re going to start off with a bike that makes more power as standard than your rivals have with a race exhaust. 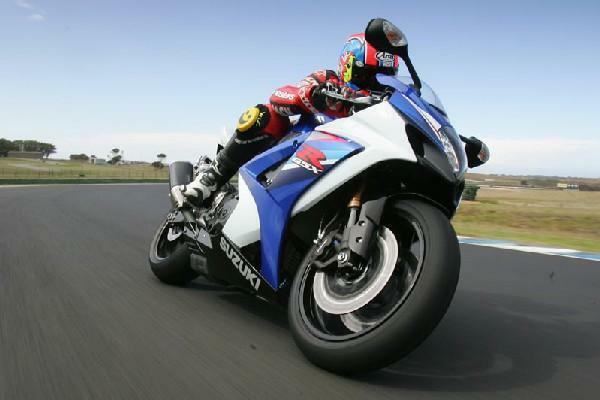 Something tells me it’s going to be the year of the GSX-R1000 K7. Check out this week's MCN, available from wednesday, February 14, 2007 for the full road test feature.